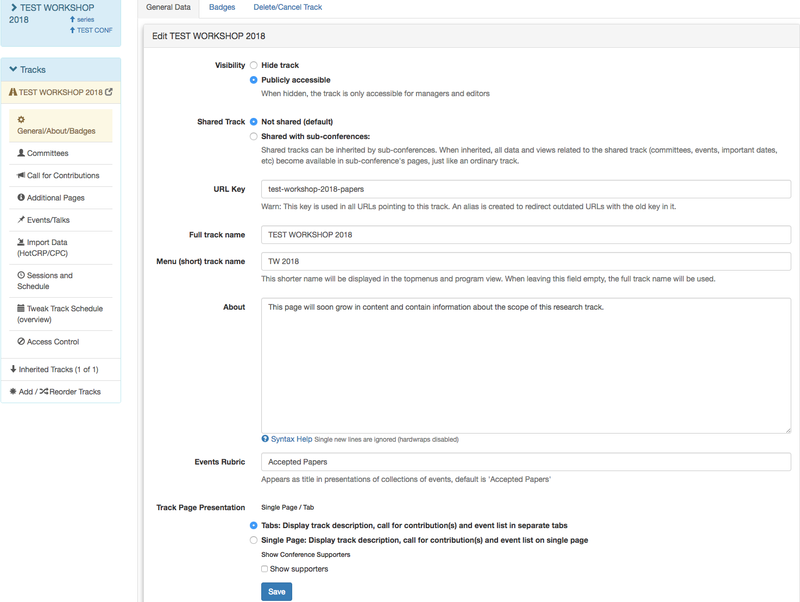 Just browse any of the conference websites to get a grasp of what track pages may look like. One or more Call for Contributions giving detailed information on the track (and conference) and how to submit a contribution. Additional pages, e.g. with information about the paper format etc. Tracks can be shared with sub-conferences. This is useful for tracks that apply to multiple conferences, e.g. a social events track. Shared tracks are to be embedded by sub-conferences. Control over embedding can be done at both sides (at the shared track and at the sub-conference). An embedded track will appear in the track menu for a sub-conference, and all views and data of the shared track (e.g. committees, important dates, call for contrib) will become available in the context of the sub-conference.